2018 was a volatile year for Americans. While the U.S. economy and jobs reached encouraging new heights, investors faced a hair-raising roller coaster ride of partisan politics, trade wars and a bear market in tech stocks. Will 2019 bring more of the same? Is the worst already over? Or do the financial markets now face a dangerous tipping point? Which markets offer the most safety and potential growth? Stocks, bonds, housing? 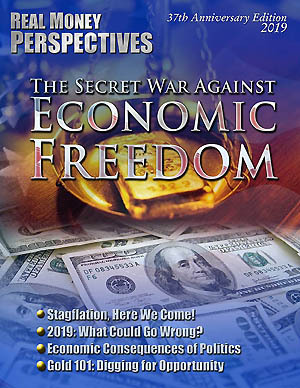 Our 2019 issue of Real Money Perspectives offers readers a panoramic view of the uncertain terrain ahead from a select few of the world’s brightest financial minds. You'll learn how to “de-politicize” and inflation-proof your savings and investments using tangible wealth. Together we can build a more secure future while also learning the importance of leaving an eternal legacy behind us. To request your print copy or PDF electronic version, please call 800-289-2646 or register online today!